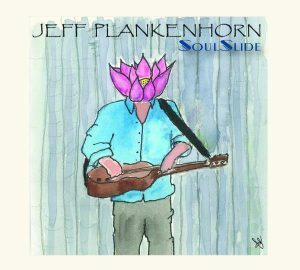 Texas slide guitarist Jeff Plankenhorn’s latest release, Soulslide, captures slide guitar in a way that excites and inspires. This album features an all-star line-up including, Brannen Temple – drums, Yoggie – bass and Dave Scher on keys. Rami Jaffe, best known for keyboards with such bands as The Wallflowers and Foo Fighters, also contributes his talents here. Peter Adams lends a hand on the clavichord, Hammond organ, and Wurlitzer. Ruthie Foster, a multi Blues Music Award winner, and Miles Zuniga showcase their talents on the six string and vocals as well. Zuniga can also be heard playing piano and bass on the album. The list continues with Tim Pierce on both electric and acoustic twelve-string guitar, and background vocals. For those who are fans of The Resentments, Plankenhorn has enlisted Scrappy Jud Newcomb on twelve string electric and acoustic guitars, Bruce Hughes on electric bass, and John Chipman on drums. “Mockingbird” captures a lazy summer afternoon in any town USA. The song makes listeners slow down and relax for a few minutes before returning to reality. “Like Flowers” features renowned singer-songwriter, Ruthie Foster and comes at you full speed, building to an eruption! This duet is quite stunning. As an added treat, Foster returns in “Dirty Flour.” This time, she lends her voice as backup vocals. “Born To Win” has a little bit of funk, a little bit of soul and a rockin’ beat guaranteed to have anyone within earshot kicking up their heels. “Walking in the Sun” speaks about being able to open your mind to different opinions and seeing life through someone else’s eyes. “Kansas City Nocturne” shows Plankenhorn’s instrumental side. Though it is the shortest song on the album, the emotion is both plentiful and powerful. Soulslide is Plankenhorn’s third studio album, his fourth overall. Whether you are a fan of acoustic, slide, or electric blues, this album does not disappoint. Pick up your copy soon!